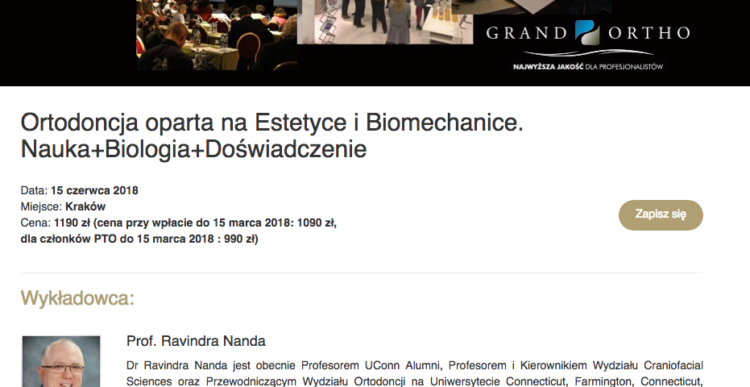 Grand Ortho a leading organizer of Orthodontic educational courses in Poland, will hold a one day course by Ravindra Nanda in Krakow, Poland on June 15, 2018. Professor Ravindra Nanda is the foremost speaker on advances in contemporary Orthodontics. He is currently Professor Emeritus at the University of Connecticut. Grand Ortho is the sole representative of Forestadent Gmbh, Pforzheim, Germany, a premier orthodontic products manufacturer, and distributor. Dr Ravindra Nanda is a professor in Uconn(University of Connecticut) and Head of the Department of Craniofacial Sciences and Chair of the Division of Orthodontics at the University of Connecticut School of Dental Medicine. Take a closer look at the bottom of the screen.